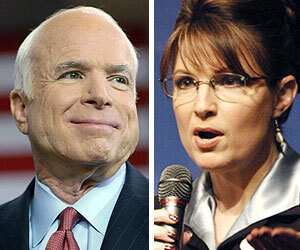 GOP Presidential nominee John McCain has picked Alaska Gov. Sarah Palin for his VP, a self-styled "hockey mom" and little known Alaska governor. Palin, 44, is a first-term governor, pro-life advocate, former beauty queen -- and hockey player. She's been described as "tough as nails" -- and when she was young, her father reportedly took her moose hunting in the middle of the night. She is the first female running mate on a Republican presidential ticket. The pick comes as a surprise, as Minnesota Gov. Tim Pawlenty was thought to be the top choice. Sarah is a mom to five -- Bristol, Willow, Piper, Track and Trig, who was born in April with Down syndrome.